Brett McGurk, the U.S. special presidential envoy for the global coalition to counter the Islamic State group. Brett McGurk, the U.S. special presidential envoy for the global coalition to counter the Islamic State group, has been meeting with partners in Kuwait this week, looking to build on the gains the alliance has made in countering and, in many instances, crushing IS militants in Iraq and Syria. VOA's U.N. Correspondent Margaret Besheer spoke with McGurk about where the fight against Islamic State goes next. Besheer: "Special Envoy, welcome. So you just had this meeting here in Kuwait. Is there a long-term political and strategic road map for countering ISIS and making sure it doesn't regroup and re-emerge in Iraq and Syria?" McGurk: "Well, in terms of countering ISIS (IS), you have to take into account where we were three years ago. I remember being here in Kuwait three years ago where nobody thought they'd be able to take back territory from ISIS. They were controlling, really, basically a quasi-state with 7 million people. They were planning attacks all around the world. They were committing acts of genocide, and they were approaching the capital of Baghdad. So, since then, almost 100 percent of their territory has been taken back, and most important, they haven't reclaimed any of these areas. So in Iraq — the focus of the meetings today, really — 100 percent of the territory in Iraq has been reclaimed from ISIS, so that's quite extraordinary. But you ask about whether this will be sustainable. I think I'll make three points. Number one, they haven't retaken any territory. Number two, in areas that they have lost, 3.2 million Iraqis — these are almost all Sunni Arabs who fled ISIS — are back in their homes. That's an unprecedented rate of returns in a post-conflict environment like this. And now, today, the third point I make is you see really the entire world coming to help Iraq get back on its feet. And the underpinning of this is an initiative of the Iraqi government with the World Bank. So they have put out to the world, just Monday here in Kuwait, their 10-year vision. It's a 10-year plan of reconstruction, investment, and the foundational kind of landmark event here to get this started is today. This is just a — this is not the end of the road. It's really the beginning of the road of a 10-year process of recovery, but I think it's an encouraging start. Besheer: But at the same time, [U.S.] Secretary [of State Rex] Tillerson announced, I think, it was $200 million for newly liberated areas in Syria, but none for the newly liberated areas in Iraq. So how does that play into that strategy? FILE - Iraqis displaced from Mosul receive aid distributions near Qayara, Iraq, Dec. 28, 2016. ​McGurk: Well, we're the number one contributor to humanitarian aid in Iraq. We're the number one contributor in stabilization assistance in Iraq. We're the number one contributor in military support in Iraq. A lot of our support is still in the pipeline, so of course we have a budgetary cycle of the way these things go, but we also announced yesterday — Secretary Tillerson announced an important signing of the Iraqi Minister of Finance with the EXIM Bank [the Export-Import Bank of the United States, the government's official export credit agency] ​— about $3.3 billion to support financing for U.S. companies to do business in Iraq. And U.S. companies in Iraq are doing quite well. I mean, General Electric helps provide for almost 60 percent of all of electricity generation in Iraq. So, look, this is going to be a long-term effort. The one point I want to make out of the conference here, because I've read some stories about, well, this is just a one-day event and they have to try to raise $10 billion — that's not the case. Iraq put out a figure on Monday here that they need about $80 billion over the next 10 years to help finance their reconstruction. They also made very clear that most of their reconstruction assistance will come from their own budget, their own reform process — working with the IMF [International Monetary Fund], working with the World Bank, to reform their own mechanisms. So, they're really not asking for handouts. They're asking for a hand up to get themselves moving, and I think so far — of course, the meeting is still going on here, right down the hall — I think so far, the responses have been quite encouraging. Besheer: So what do you think the game changer has been in the progress you've made against ISIS in Iraq and Syria? What was the key to it? Was it the choking [of] the funding or the military or a combination — I mean, what was the game changer? McGurk: Well, I can go through a whole strategy. We have five lines of effort in the global strategy — we can go through that. FILE - Iraqi army soldiers search a house for Islamic State militants and improvised explosive devices (IEDs) north of Mosul, Iraq, Jan. 19, 2017. I want to make two points when it comes to Iraq. Number one, a very different way to fight the war on the ground. So when we say by, with and through, we really mean it. This was Iraqi-led. The Iraqis did the fighting, the Iraqis cleared their cities. It was the Iraqis who then held the cities and held the ground, the Iraqis working with local communities. The U.S. forces, coalition forces, were behind helping them and assisting them; we were not doing the fighting on the ground. And I think that model has actually proven to be quite effective. Number two, we did an awful lot of diplomacy, and a lot of it behind the scenes — but not only to get the whole world organized to combat ISIS globally, to fight their networks, the finances, the foreign fighters, but also to have the region engage with Iraq. So, some of the biggest contributors here just down the hall today are really quite amazing. Turkey, one of the biggest contributors today — $5 billion of reconstruction assistance to Iraq. Saudi Arabia, Qatar, UAE [United Arab Emirates], Kuwait, of course, with $2 billion. If you add all that up, it comes to a little less than $10 billion or so. UAE announced a fairly extraordinary private sector investment of $5 billion for an Iraqi housing project outside Baghdad. So, this engagement from the region was really not happening some years ago, and I give credit really to [Iraqi] Prime Minister [Haider al-]Abadi and his government. They reached out to the region and they helped build some bridges that had been closed. So Saudi Arabia — you used the word "game changer." I don't really use that word too often, but Saudi Arabia for the first time in 30 years reopened its borders with Iraq a few months ago, direct flights from Saudi Arabia into Iraq for the first time in 30 years, and then you saw the investment the Saudis are just making now in Iraq. So, those are the types of shifts that are quite important and that we want to try to encourage to make sure that the defeat of ISIS is enduring. Besheer: So, ISIS may be down and out in Iraq and Syria, but not so much in places like Libya, West Africa, Afghanistan. So how are you going to replicate the success you've had to date in those places? Is it a similar model or does it change with the environment? 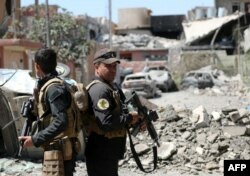 FILE - Iraqi Counter-Terrorism Services (CTS) soldiers secure a street near the Old City in west Mosul on June 3, 2017, during their ongoing battle to retake the city from Islamic State group fighters. ​McGurk: It's a great question. So each region is different, and we look at this — we look at this very carefully. I mean, every single day, 24/7, we're looking at how the networks are emerging, where people are moving, how they're getting money. So the one thing we have to do, of course: ISIS tries to be a global network. That's what makes it different than kind of other terrorist organizations. It has become a metastasized global network. And so what we had to do was build a global network to fight the network. So, yesterday here just in Kuwait, we had all now 75 members of our coalition — Philippines joined just yesterday, so one of the largest coalitions in history — united to work together against this threat. And that's the counterideology, the countermessaging. It's the counterfinancing, it's the counter-foreign fighters. And then we look at each different region of the world and who among the coalition wants to take the lead in that part of the world, and what particular tools might be needed, say, in Philippines versus Afghanistan versus in Iraq. So every place is different, but by building this international consensus and this international coalition, that's really the only way to stay ahead of the threat. We're making progress, but the number one message yesterday in our coalition meetings is that we've made a lot of progress in the last three years, there's no question — but this is not over. And that was the point from almost every delegation we heard yesterday: This isn't over. We remain united as a coalition. We actually approved — all 75 delegations — a document called The Guiding Principles to guide the coalition as we go forward into the next year. And the key point of that is that this isn't just about Iraq and Syria, it's about the global campaign. So there was real unanimity in that room yesterday, led by Secretary Tillerson. And so you know, we're going to stay at it. This isn't over, and we're going to keep our foot on the accelerator. Besheer: Finally, I just like to ask you about accountability, because that's a big issue. They found massive graves in liberated areas in Iraq, ISIL/ISIS-liberated areas. What about accountability for the victims of ISIS? McGurk: So, this is also worth reminding people, what was happening in some of these areas not very long ago — you know, mass atrocities, acts of genocide, destroying our common heritage, thousands of young girls taken hostage and many of them are still missing, and we still meet with the families and we do all we can to find leads to try to rescue as many girls as we possibly can. But, look, it gets back to the point I just made: We cannot rest against this enemy, and that means not only defeating them, but also following through and making sure that their defeat is enduring and they can't come back, and that justice is done to those who committed these terrible crimes. In Syria now, you know, they're all trying to escape, so we have in Syria detained over 400 foreign fighters, including some of the most notorious former ISIS leaders, and we're going to make sure that they can never get out. And we're working with coalition countries and partners, if they happen to be their citizens, about how they are going to be prosecuted, how they're going to be handled. This is a very difficult issue within our coalition. But we are very much determined that justice will be done for these terrible crimes.